It happened like this. I was stolen from an airport. Taken from everything I knew, everything I was used to. Taken to sand and heat, dirt and danger. And he expected me to love him. 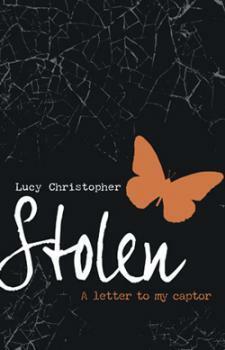 Sixteen year old Gemma is kidnapped from Bangkok airport and taken to the Australian Outback. This wild and desolate landscape becomes almost a character in the book, so vividly is it described. Ty, her captor, is no stereotype. He is young, fit and completely gorgeous. This new life in the wilderness has been years in the planning. He loves only her, wants only her. Under the hot glare of the Australian sun, cut off from the world outside, can the force of his love make Gemma love him back? The story takes the form of a letter, written by Gemma to Ty, reflecting on those strange and disturbing months in the outback. Months when the lines between love and obsession, and love and dependency, blur until they don’t exist – almost. Any review that I write for this book won’t be able to do it justice. It’s so hard to put into words the wide range of emotions that I felt while reading this and how deeply this book affected me without giving too much away, but here goes nothing. Stolen is definitely one of the best books that I have ever read – the number of times I had to put it down because I was crying too hard to see the words on the pages can attest to that. The characters are incredibly real and complex, to the point where you too are experiencing Stockholm Syndrome. The Australian Outback, where much of Stolen takes place, is more than just a setting – it’s beautiful yet dangerous, harsh yet loving, and is truly a character in its own right. I keep meaning to read this one. All I’ve ever heard about it is good things! Glad you loved it as well.